Driving down the highway the other day I observed a number of road-killed skunks, deer, raccoons, and unidentifiable blobs of fur and muscle attended to by large blackish birds with red heads. 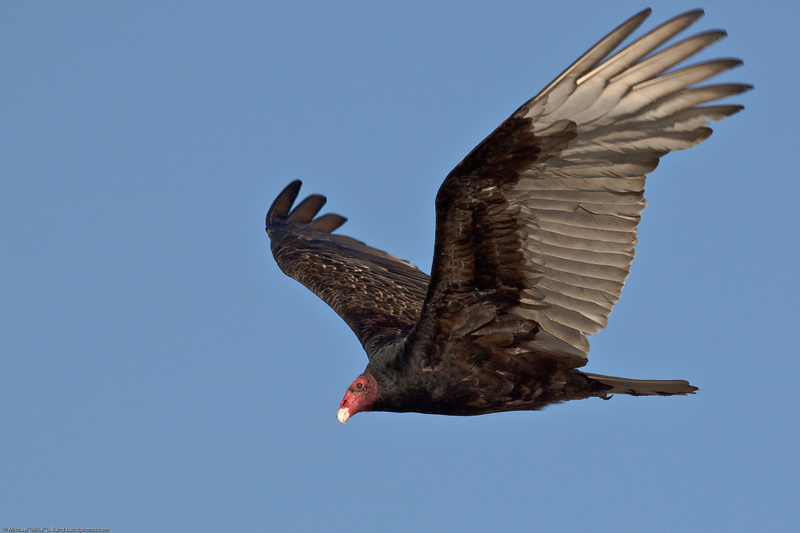 These often misunderstood creatures are our friendly Turkey Vultures, filling their role as avian recyclers. Although some consider them ugly and their habits unappealing, they are indispensable, eating the bodies of animals that have died due to disease or accident and contributing to the health and beauty of the environment. For years, people have mistakenly thought that seeing soaring vultures is a sign that an animal carcass is found nearby. Actually, the birds are just enjoying updrafts caused by wind or heat, and when they reach an appropriate height, they lose altitude in a downwards glide while searching for food or migrating. You can distinguish a flying vulture easily because the bare head seems smaller than those of hawks or eagles, the wings are usually held in a semi-v shape, and the tips of the wings are bent upward. Hawks usually don’t bend the tips of their wings upward and eagles fly with their wings flat. The red head gives the vulture its ominous appearance, but is simply due to a featherless head; a feathered one would be very hard to clean after poking around in a dead deer. A bald head provides very little habitat for bacteria to grow. In addition, vultures defecate on their legs and feet, killing whatever parasites might try to live there. After a meal, vultures can often be seen perched on trees with wings outstretched, letting the sun disinfect their feathers. Their often maggot-infested and bacteria-laden meals are handled by the birds’ high stomach acidity which digests everything quite well, even bones. But carrion is not a predictable source of food, so vultures gorge themselves when they can, sometimes to the point of not being able to take off right after a meal. You would think this would make them vulnerable to predators, but evolution has solved this problem nicely. If a vulture is attacked, it vomits. Both the smell of the recent meal and the acidity of the stomach contents are more than enough to scare off any predator or competing scavenger like a coyote. So don’t try to sneak up on one. Recent DNA evidence demonstrates that vultures are related not to hawks, but to storks – storks have bald heads and some are scavengers. The particular family that vultures belong to is Cathartidae – coming from the word catharsis, to throw up. Scientific words often make elegant sense! Vultures are found everywhere except Antarctica and the bird with the largest wingspan of any land bird is a vulture – the Andean Condor. When a friend and I visited Chile, we saw a number of Andean Condors, but most were very high and hard to see. So we laid in the grass, still like carcasses, eyes upward. The birds were fooled long enough that they lost some altitude to get a look at us and for us to get a good look at them.